Plants are the oldest living creatures on Earth. The resources to learn about plants we collect will help learners to be more engaged in learning about it. Every year we learn about plants, but we never get bored with this topic. Although we include the same things each year, there must be some new knowledge in this topic. For that reason, we would like to share some great resources that have given us a lot of being amazed moments in learning. Here are some resources to learn about plants. This book is suggested to use by Elemental Science that we are using at the moment. From Amazon: How many seeds can a tumbleweed scatter? Which plants can force rocks apart? How can bacteria help plants? Are plants all made of the same basic parts? How are a bean sprout and an oak tree different? Do all plants have leaves? ‘Plant Parts' provides the answers you want. From Amazon: What is the dance of the chromosomes? Which flower smells of rotting meat? What is the Millennium Seed Bank? How do plants develop? What is cross-pollination? How do insects help new generations of plants? ‘Plant Reproduction' provides the answers you want. From Amazon: What is a tropism? How do plants use hormones? What happens in a meristem? What do plants need to grow? How do they make their own food? What happens when they die? ‘Plant Growth' provides the answers you want. From Amazon: Which plant has flowers up to three feet across? How do plants give us energy from sunshine? How is VIADOCS helping scientists? How are plants organized into different groups? Can you easily name plants? Do you need a microscope to identify a plant? ‘Plant Classification' provides the answers you want. A wonderful book to introduce children about the growing direction of plants in the garden. I love the rhyming delivery. From Amazon: From seeds dropping into soil to corn bursting from its stalks, from children chasing butterflies to ants burrowing underground, everything in this vibrant picture book pulses with life —- in all directions! From Amazon: This educational and enjoyable book helps children understand how to plant bulbs, seeds, and seedlings, and nurture their growth. Lois Ehlert's bold collage illustrations include six pages of staggered width, presenting all the flowers of each color of the rainbow. A tree is the biggest plant that grows. Trees can live for a very long time, and they are alive all year long, even when they look dead in winter. Clyde Robert Bulla's accessible text and Stacey Schuett's lush, accurate illustrations follow a tree's continuous life cycle through spring, summer, winter, and fall. This is a book to explain the color changing of leaves during the fall. There are some diagrams of leaves that are very interesting for children to find out the scientific explanation of the question. This book shows leaves with different shapes and colors. Very interesting to read to show children the variety of leaves, especially during the autumn. From Amazon: Shows a variety of flowers, tells how they are pollinated and form seeds, and describes some of the useful products we get from flowering plants. A biography of George Washington carver. Brief text and pictures present the life of the man, born a slave, who became a scientist and devoted his entire life to helping the South improve its agriculture. From Amazon: Looks at the growth of a flower from seed to the time it is a mature plant capable of producing new seeds. This book features illustrations, photographs and easy-to-read text that help young readers learn: how seeds are formed and what different types of seeds look like; the various ways flowers are pollinated; and more. I love all books by Gail Gibbon. This book is suitable to introduce the scientific parts of plants for children K-2. They just know that plants are also unique. From Amazon: Ms. Frizzle's class is growing a beautiful garden. But, Phoebe's plot is empty. Her flowers are back at her old school! So, the class climbs aboard the Magic School Bus. And, of course, the kids don't only go back to Phoebe's school, but they go inside one of Phoebe's flowers! Follow the kids' adventure and learn how living things grow. This book introduces children to how the plants grow from very tiny seeds blown by the wind in the autumn. This book has a unique illustration as the other Eric Carle's books. I love reading this book to my grade 2 and 3 students when I was teaching at school. The pictures are very simple, but it can make children curious to find out where the carrot is. From Amazon: Text and photographs introduce the stems of plants, including information on how they grow, along with their uses. From Amazon: Learn how plants store food during the winter and carry water up to the leaves through roots and stems. From Amazon: Text and photographs introduces the roots found on trees and plants, including how they grow, along with their uses. From Amazon: Kids can peek underground, dig into the wonders of roots and discover all the amazing things roots do for trees and plants. Whether children are junior gardeners or simply curious about the trees they climb and the flowers they pick, this picture book shows the side of the story they don't see-the underground story. Learning about plants is also called as botany. For several years, we have tried different kinds of botany curriculums and here are the recommended curriculum for botany. We love doing notebooking in studying about plants. In this unit, we use some sets of notebooking pages. I am an affiliate of notebookingpages.com. 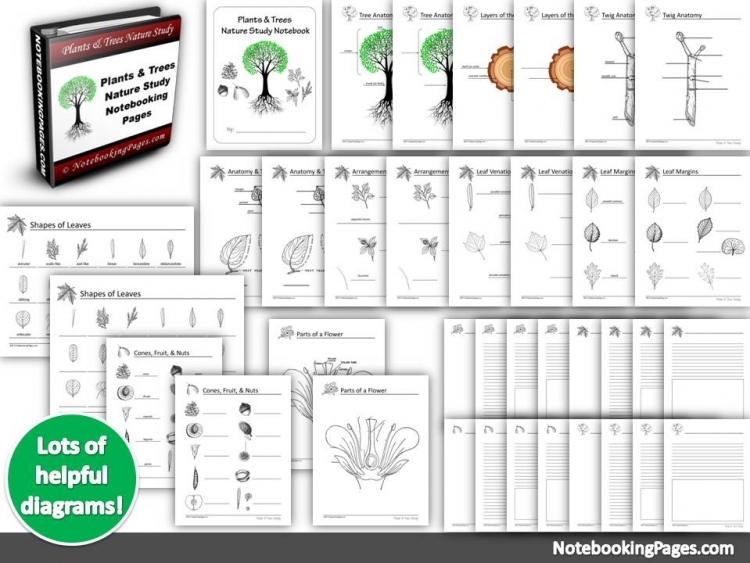 We really love this products and I would like to recommend it to anyone to do the plant unit notebooking activities. Check them out by clicking the images below.